One of the few provisions in the proposed Senate tax bill that has bipartisan support is increasing the Child Tax Credit (CTC), which has been designed to better reflect the costs of raising children. It has been cited as a major benefit to working and middle-class families with children. Like other provisions, however, this change is done in ways that provide almost no help to working low- and moderate-income families, while providing huge breaks for very wealthy ones. For middle-income families, the gains from a higher child tax credit are mostly offset by losses in personal exemptions, and some middle-class families would actually pay more under the proposals than under current law. The Senate and House versions both provide information needed to calculate the taxes different tax filers would pay on their 2018 income (the year the changes go into effect) and to then compare these with the taxes they would pay under current law. In the Senate version, the partially refundable portion of the CTC is unchanged, except that it would be indexed for inflation going forward, increasing to $1,100 in 2018. The nonrefundable credit is increased by $1,000 per child, making a maximum credit per child of $2,000 (the House version provides only an additional $600 credit, in addition to also indexing the partially refundable portion to $1,100). 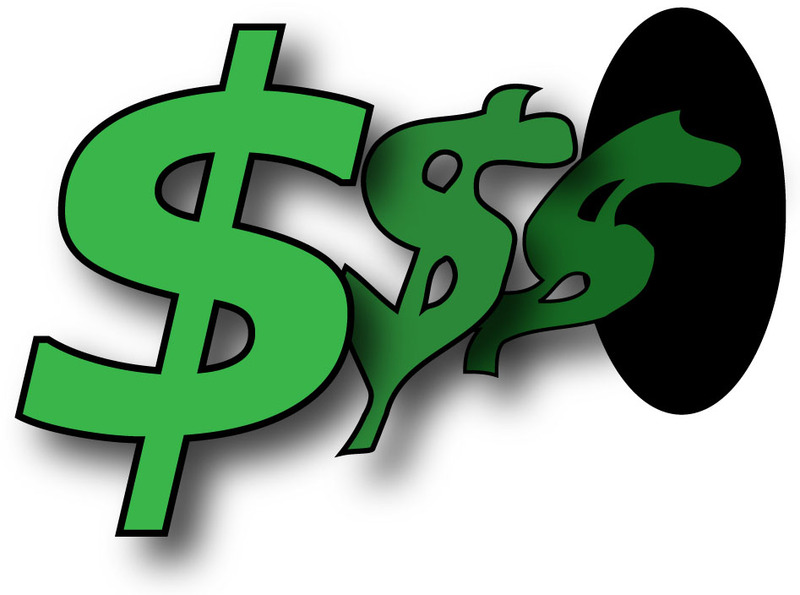 Both bills extend eligibility for higher income families (from a current phaseout beginning for married joint filers at $110,000 of adjusted gross income to $500,000 in the Senate version and an even higher level in the House version). 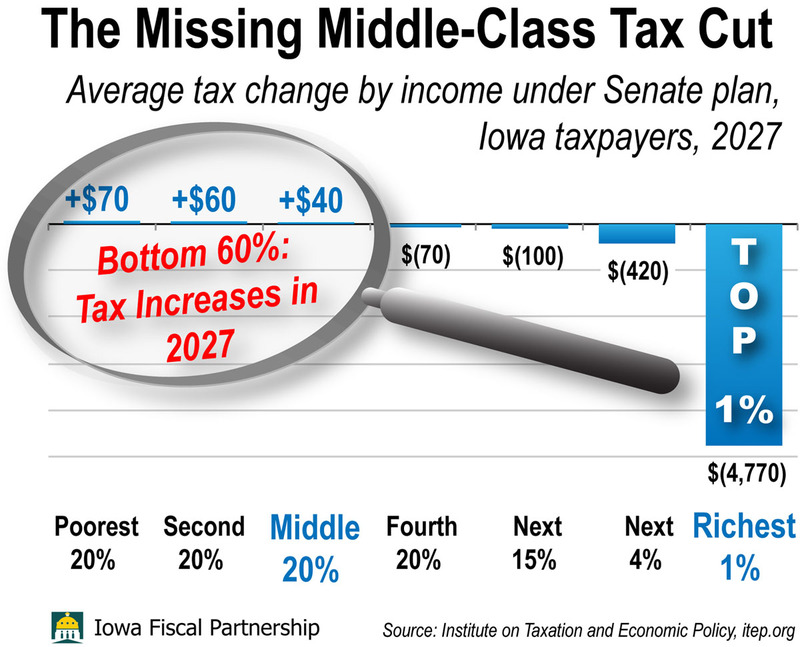 Performing the comparison of what tax filers in 2018 would experience from the CTC increase, a single mother with two children working full time and making a little above the minimum wage, $16,000 per year, gets no benefit under the House version and only $75 under the Senate version, compared with current tax law. A married couple with two children making $29,600 only receives the additional $100 per child of the refundable credit under the Senate and House versions. That the CTC provisions largely leave behind low and moderate-income families is particularly unfortunate, as these are the families that live paycheck to paycheck and could most benefit from additional support in raising their children. Meanwhile, a married couple with two children making $300,000 per year gets the full benefit of the tax credits, $4,000 for the two children under the Senate version. This is on top of a tax cut from other changes in the tax code of at least $8,639 (which would be more if the family has extensive itemized deductions or tax-exempt income). Overall, this family is at least $12,639 better off after doing its taxes, compared with current law, $4,000 due to its new eligibility for the CTC. For simplicity, these examples assume that all income is earned income and that the filers all take the standard deduction. 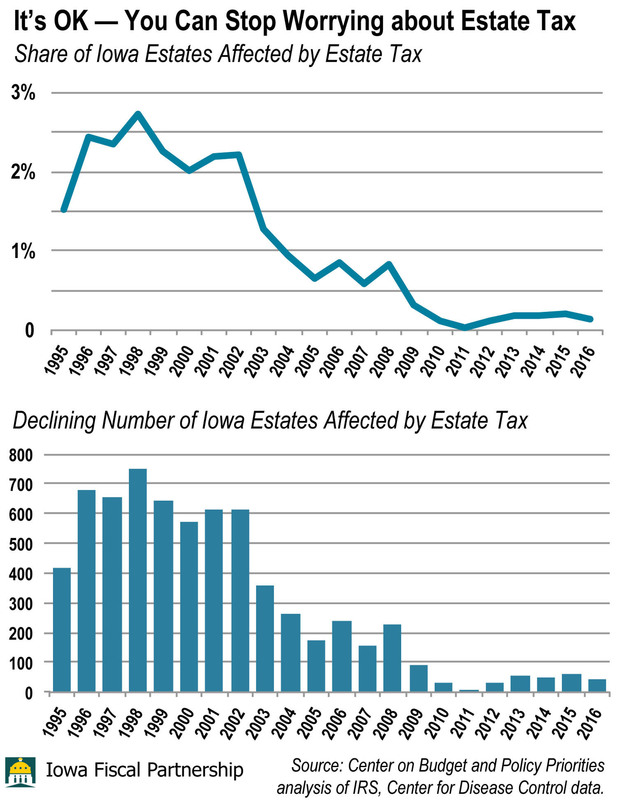 If, because of buying a home, paying state and local taxes or a combination of the two, middle-income taxpayers now itemize their deductions, the increase in the standard deduction may not help at all and the loss of personal exemptions may mean they pay more taxes. A married couple starting out with a young child and $60,000 of income, for instance, who now claims $24,000 as an itemized deduction ($18,000 in mortgage interest and property taxes, $4,000 in state and local taxes, and $2,000 in charitable contributions or other deductions) would owe $359 more in federal taxes under the Senate version. Although the family would benefit from the increase in the CTC, that would be more than offset by other changes, such as the loss of personal exemptions. Tax proposals should be examined both in terms of individual provisions and in terms of their overall impact. 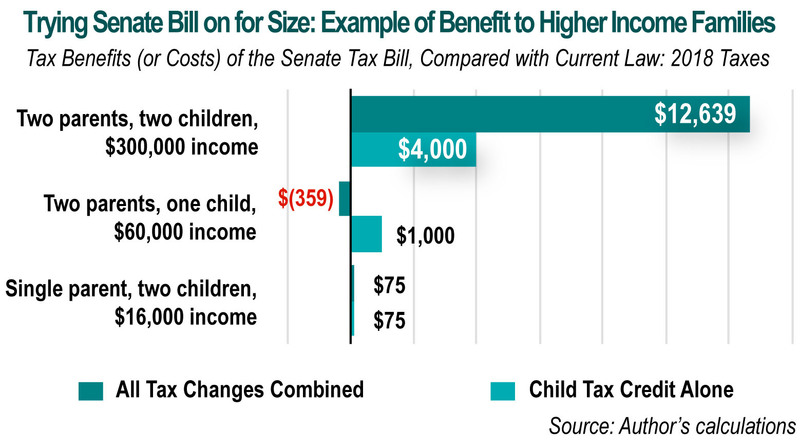 On the former, under the Senate version the benefits of raising the Child Tax Credit are highly skewed toward the highest income tax-filers. This needs to change, by making the CTC refundable and not extending it so dramatically to the highest income families. 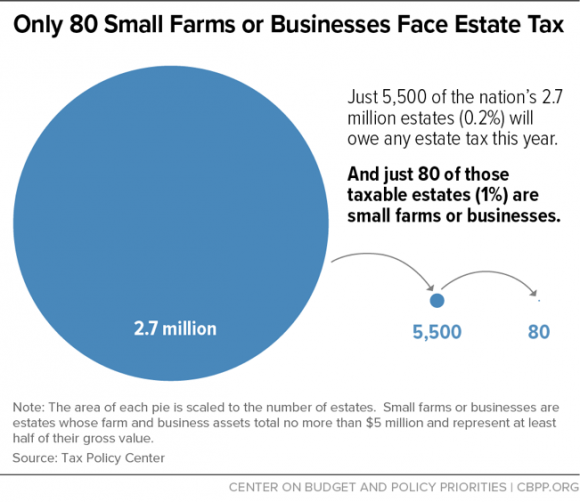 On the latter, the overall structure of the tax provisions largely negate the positive impact expansions of the CTC have for many middle-income families, while bestowing even more benefits on high income ones. Tinkering with the CTC without major changes in other provisions in the tax proposal cannot correct these flaws. Rather than adding CTC provisions to a bill with other fundamental flaws, Congress should start with how it can make the CTC better reflect the cost of raising families. 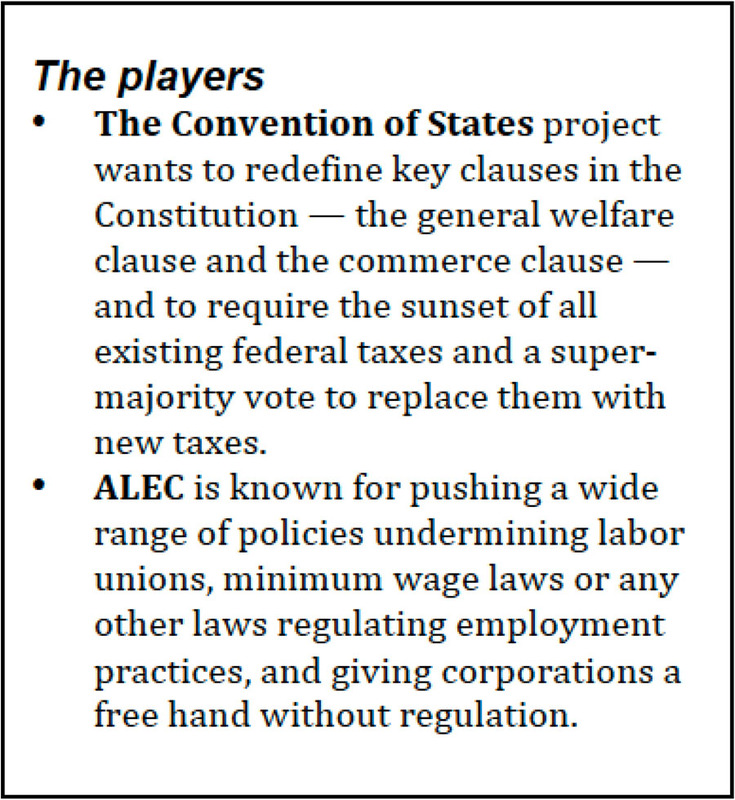 There exist different bipartisan proposals that would do this, but the proposal before Congress goes in the opposite direction. Charles Bruner of Ames, a former member of the Iowa House and Senate, is director emeritus of the Child and Family Policy Center in Des Moines. CFPC, he worked with the Iowa Policy Project to form the Iowa Fiscal Partnership. Find his commentary on current issues at childequity.org. Contact him here.